Product prices and availability are accurate as of 2019-04-12 06:01:47 EDT and are subject to change. Any price and availability information displayed on http://www.amazon.com/ at the time of purchase will apply to the purchase of this product. 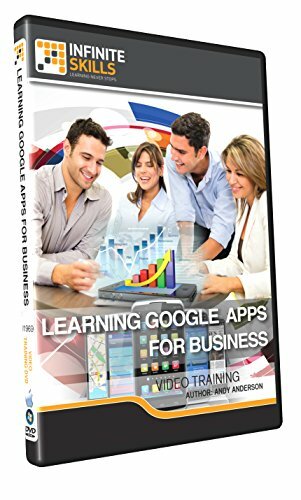 In this Google Apps for Business training course, expert author Andy Anderson teaches you how use the features of each Google App for your business needs. This course is designed for the absolute beginner, meaning no prior experience with Google Apps is needed. You will start by configuring your Gmail account, then move on to controlling your Gmail inbox, learning things like adding attachments, creating a signature, and organizing your emails with labels and stars. Andy will then show you how to work with contacts and tasks, the Google calendar, and Google Drive. This video tutorial also covers working with Google Documents, Google Presentation, Google Spreadsheets, and using Google forms. Finally, you will learn about the admin options available, including user passwords and security, and adjusting the company profile. Once you have completed this computer based training video, you will be able to utilize the features of these Google Apps for your business needs. Learn Google Apps For Business from a professional trainer from your own desk. Visual training method, offering users increased retention and accelerated learning Breaks even the most complex applications down into simplistic steps.